Telekinesis (TK), also known as Psychokinesis (PK), is the ability to move an object using your mind. This mental power allows you to levitate or move objects at a distance. We see this sort of thing in movies, however, is it something that we as humans can actually do? The movie Carrie is a great example of telekinesis as it showcases this ability best. The main character, Carrie, can move objects with her mind. She is bullied in school which is what leads her to discover her telekinetic powers. Unfortunately, she uses her special skills to seek revenge on those who’ve wronged her resulting in an unhappy ending. While this is a fictional film and character, telekinesis is claimed by several people to be a real thing. This phenomenon has been studied for years by parapsychologists. 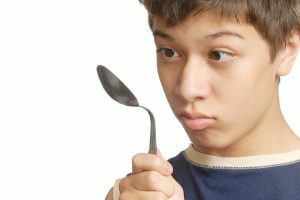 There is no scientific proof that telekinesis is real, and, in its history, it could never be proven as something real since it can’t be explained by scientists. According to scientists, for something to be real, it should be able to be measured, tested, and explained. Telekinetic powers have not been proven as of today which is why so many individuals are skeptical and don’t believe in telekinesis. While the case for telekinesis remains weak, many individuals believe to have this ability within them. If you really put your mind to it, you could develop telekinetic abilities yourself. So if you really want to learn Telekinesis, keep reading. In this guide, we will cover everything you need to know to begin developing your skills. Let’s get started on this exciting journey! Before you begin the process of developing telekinesis powers, you need to believe in it. Also, you really need to fine tune and hone your concentration skills when it comes down to learning telekinesis. The deeper you are able to concentrate, the quicker you’ll be able to develop telekinesis abilities. Relax – Do whatever it takes to relax and clear your mind. Meditating is a great way to achieve this and strengthen concentration. Other individuals like to exercise or take a hot bath to prepare themselves. Believe – If deep down you believe telekinesis is a myth and does not exist, you won’t achieve telekinesis. This is the biggest obstacle you can face, so you need to convince yourself that it’s real and can be learned. Visualize – What is it that you’re trying to achieve? Do you want to bend that spoon? Move that cup a few inches, right? Before you can do this, you need to make it a part of you and visualize it happening. Practice – The most important part of anything you try to perfect is practicing. Work on your telekinetic abilities for about 10-15 minutes a day. This power is not something you’ll have overnight. You need to work for it day after day. Patience is key – All great things take time, and this is no exception. Progression levels vary from person to person so don’t get discouraged when you don’t receive the results you want right way. Along with practicing these methods be sure to work on and strengthen your concentration daily. If you can only concentrate for a few minutes you will not be able to progress in this journey of telekinesis. Focus on the object you wish to move for about 10 minutes until you get that sensation that it’s become a part of you. Visualize in your mind the object moving as you’d like it too – whether it’s bending, levitating, or simply moving. Without using force, try to move the object. 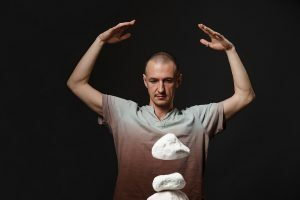 These are the basic steps in practicing telekinesis, and you want to work on them every single day. We recommend you also take notes every day of how long you meditate, your feelings, if you were able to move the object, what exercises you used, etc. This information will all be useful for your progression. Begin every day with a warmup exercise to strengthen and activate your concentration and visualization. The Psi-ball method is a good and easy one to try. Simply warm up your hands for 1-2 minutes by rubbing them together. What is happening here is you’re charging the energy field in between both hands. After a minute or so pull hands apart and feel this energy. Based on the feelings you receive, form a ball and concentrate on this connection. Do you feel a strong or week energy? Is it warm or cold? Does it push or pull? Play around with this exercise every day and focus on the feeling. The Pen Roll & Pull. All you need for this activity is a pen and flat surface. Set the pen on a flat surface, sit up straight, take a few moments to breathe, and then begin the 3 basic TK steps. The objective here is to use your energy to move the pen across the table. The Cork. In this exercise, you’ll need a cork or object that floats and a bowl of water. Using the same steps as the pen roll and pull, you want to get the cork to move from on side of the bowl to the other. The Pendulum. Make your own pendulum using a string and ring (no gemstone). If you don’t have a ring, use a key. As the key or ring hangs there, use your concentration and visualization to move it back and forth. The Feather & Jar. This method is great for levitating objects. All you need is a jar with a lid and a feather. Place the feather in a clean, dry jar. To avoid air coming in secure the lid on tightly. Your goal here is to use TK to make the feather float or move. The Candle Flame. This is a cool exercise to try from time to time. All you need is a candle and something to light it with. Make sure all fans are off and there is no wind in your area. Light the candle and try to make the flame bend. The Crushed Soda Can. This exercise is great for more advanced learners. Grab an empty can of soda and place it on a flat surface a few feet from you. Place your hand over it but make sure you don’t touch it. 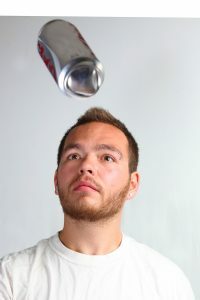 Use the force from your hand to move the energy around and grip the soda can. Compress this energy and crush the can. All these exercises can be perfected with the right amount of practice. Like we mentioned earlier, it isn’t something that happens overnight, so you want to be committed to this process. Work towards your telekinetic powersWork towards your telekinetic powers every single day by practicing one of these exercises a day. Whichever method you decide to go with on the chosen day, be sure to stick to the basic 3 rules of telekinesis: focus, visualize, and move. It’s only then that you’ll see real progression. If you’re just starting off on this exciting journey, you may fall victim to some common mistakes. Mistake number one and perhaps the biggest one of them all is letting others convince you that telekinesis is not a real thing. Once you believe this, there is no hope in developing your abilities. If you don’t believe something is possible, you’ll never accomplish it. This is why you need to believe firmly in telekinesis to be able to learn it. Remember that just because something isn’t possible for some people, doesn’t mean it won’t be possible for you. You’ll also face some obstacles like people wanting you to prove that telekinesis is a real thing. They will ask you to move an object or prove that it’s real. It’s not your job to entertain them so don’t fall for their trap. They only want to tear you down and discourage you. The second mistake you’re likely to fall victim to is expecting to see big results too quickly. Yes, we’ve seen movies where someone can move a car with their mind, however, don’t expect to be able to do this in a matter of days. The art of telekinesis is a process. It’s a journey you need to learn to avoid becoming discouraged. You’re not going to see major results in 10 minutes, so understand this is a process that varies in length for everyone. Everyone has different mental abilities and it’s up to you to develop these skills day after day. If you follow the tips in this guide, you’ll be on the road to greatness! The final mistake that we notice many people fall for is giving up to quickly. It’s always unfortunate when this happens because the reasons usually lie behind the fact that you don’t believe in your abilities or deep down you don’t believe telekinesis is a real thing. Therefore, it’s so important to fully believe in telekinetic powers before learning how to do them. If you feel like giving up perhaps it’s time to reevaluate your journey. Do you truly believe in telekinesis? If you do, then where are you going wrong? Sometimes it’s a matter of not practicing enough or not building your concentration level. 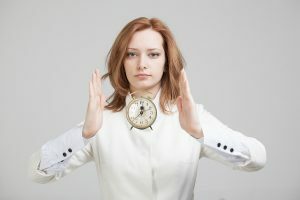 Like we mentioned earlier in this post, before you dive into telekinesis methods and activities, prepare yourself for the journey ahead of you. If you give up, you’ll never truly know how far you can go and how much you can achieve. Anyone can develop their telekinesis power if they put their mind to it. It’s a matter of learning how to and believing in oneself. We hope these tips have given you a wider understanding of telekinesis and how you can learn this ability. For any questions or if you’ve started this process, feel free to comment down below and tell us r your experience thus far with telekinesis. If you’re interested in learning more about the different types of psychic power, check out our guide to psychic abilities.